(Nanowerk News) The discovery of what is essentially a 3D version of graphene – the 2D sheets of carbon through which electrons race at many times the speed at which they move through silicon – promises exciting new things to come for the high-tech industry, including much faster transistors and far more compact hard drives. A collaboration of researchers at the U.S Department of Energy (DOE)’s Lawrence Berkeley National Laboratory (Berkeley Lab) has discovered that sodium bismuthate can exist as a form of quantum matter called a three-dimensional topological Dirac semi-metal (3DTDS). This is the first experimental confirmation of 3D Dirac fermions in the interior or bulk of a material, a novel state that was only recently proposed by theorists. Chen is the corresponding author of a paper in Science reporting the discovery. The paper is titled “Discovery of a Three-dimensional Topological Dirac Semimetal, Na3Bi.” Co-authors were Zhongkai Liu, Bo Zhou, Yi Zhang, Zhijun Wang, Hongming Weng, Dharmalingam Prabhakaran, Sung-Kwan Mo, Zhi-Xun Shen, Zhong Fang, Xi Dai and Zahid Hussain. Two of the most exciting new materials in the world of high technology today are graphene and topological insulators, crystalline materials that are electrically insulating in the bulk but conducting on the surface. Both feature 2D Dirac fermions (fermions that aren’t their own antiparticle), which give rise to extraordinary and highly coveted physical properties. Topological insulators also possess a unique electronic structure, in which bulk electrons behave like those in an insulator while surface electrons behave like those in graphene. The discovery was made at the Advanced Light Source (ALS), a DOE national user facility housed at Berkeley Lab, using beamline 10.0.1, which is optimized for electron structure studies. The collaborating research team first developed a special procedure to properly synthesize and transport the sodium bismuthate, a semi-metal compound identified as a strong 3DTDS candidate by co-authors Fang and Dai, theorists with the Chinese Academy of Sciences. At ALS beamline 10.0.1, the collaborators determined the electronic structure of their material using Angle-Resolved Photoemission Spectroscopy (ARPES), in which x-rays striking a material surface or interface cause the photoemission of electrons at angles and kinetic energies that can be measured to obtain a detailed electronic spectrum. Sodium bismuthate is too unstable to be used in devices without proper packaging, but it triggers the exploration for the development of other 3DTDS materials more suitable for everyday devices, a search that is already underway. Sodium bismuthate can also be used to demonstrate potential applications of 3DTDS systems, which offer some distinct advantages over graphene. 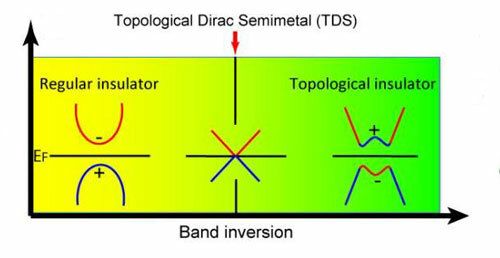 In addition, Chen says, a 3DTDS system also opens the door to other novel physical properties, such as giant diamagnetism that diverges when energy approaches the 3D Dirac point, quantum magnetoresistance in the bulk, unique Landau level structures under strong magnetic fields, and oscillating quantum spin Hall effects. All of these novel properties can be a boon for future electronic technologies. Future 3DTDS systems can also serve as an ideal platform for applications in spintronics.